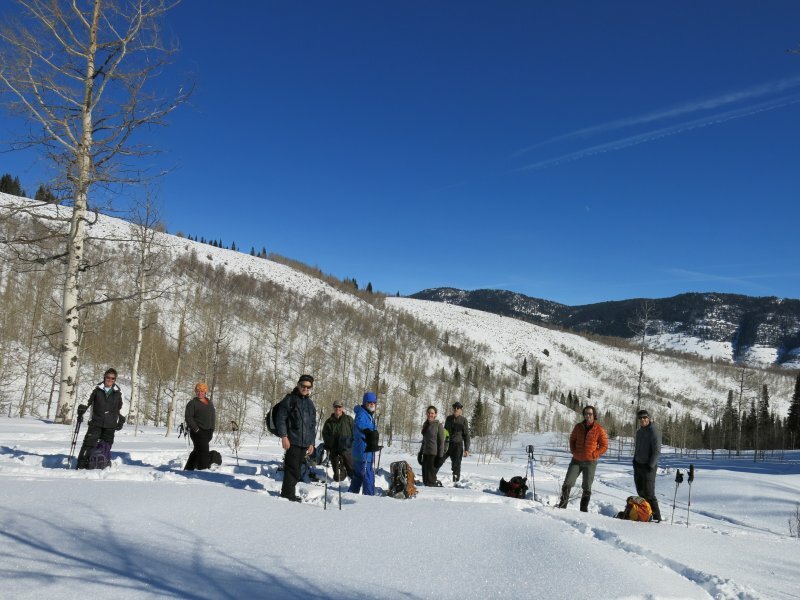 Ten Cache Hikers, Jim (the trip leader), Dave W., Dave P., Alexi, Dan, Gordon, Terry, Crista, Brandon and Alex, escaped the murky and single-digit cold air of Cache Valley for a pleasant ski and snowshoe excursion to Bunchgrass Creek. We were delighted to find clear, blue skies and comfortable temperatures upon our arrival at the Bunchgrass Trailhead. The snow was soft and loose and large ice crystals on the surface sparkled in the sun. The trail had been broken by previous snow travelers, making for relatively easy progress. Most of us were overdressed because of the cold weather in the valley, so it didn't take long before our extra clothing layers, hats and gloves came off. 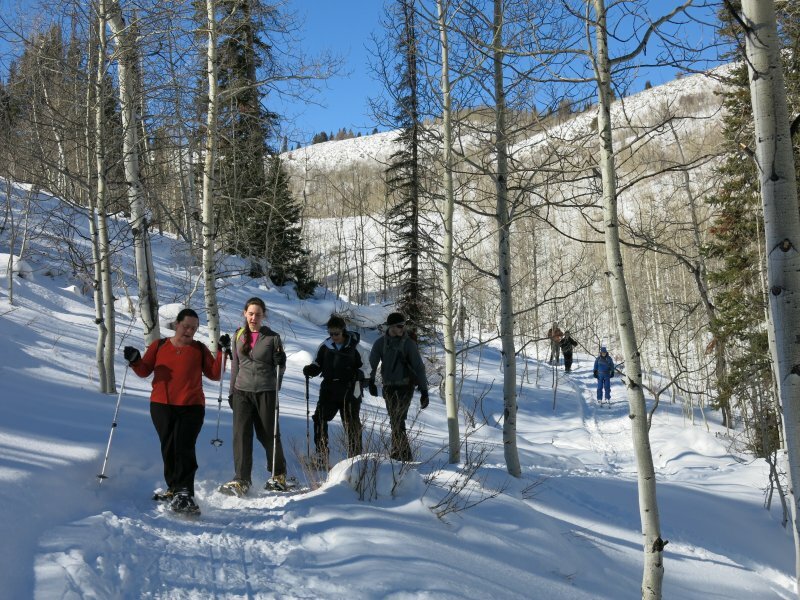 Our cross-country skiers, Jim, Dave and Dave, had to work harder than expected as their waxless ski bases gripped poorly in the loose, crystalized snow, but of course the snowshoers had little difficulty. About 12:30 we arrived at Goring Pond, our turnaround point. Here, we settled on a gentle, open slope for a pleasant lunch in the sunshine and "warm" (34 degrees) air. Dave W. and Dan dug down in the snow to make comfortable bench seating to share, Brandon and Alex fired up a gas stove and made hot tea, and we all enjoyed views of Bunchgrass Creek to the east and White Pine Knob to the west. 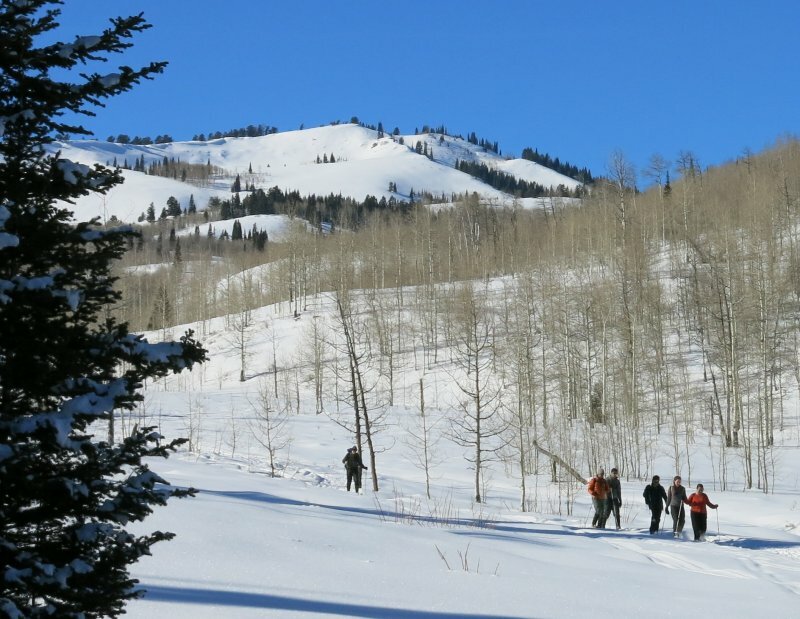 After lunch, the skiers were rewarded with fast yet forgiving snow while skiing the packed trail, but the deep, soft, untracked snow along the side of the trail was slow and challenging. The snowshoers, again, had little difficulty. We all arrived at the trailhead in time to get back to Logan at 3:00, as scheduled. This was an enjoyable trip, and a welcome respite from the temperature inversion and pollution currently gripping northern Utah. The trip totaled 3.6 miles with 750 feet of elevation. Our lunch spot near Goring Pond. Heading back down, with White Pine Knob in the background. 3.6 round-trip miles with 750 feet elevation gain.